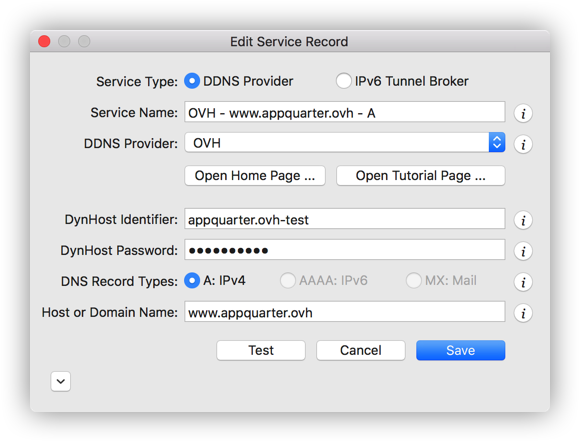 The screen shot above depicts a service record example for OVH. Most of the fields in this dialog are self explanatory, but some fields require brief explanations. DynHost Identifier and Password: Identifier and password you specify for each of your DNS zones. Login to your control panel OVH.com using your account credentials. Locate your domain of interest in the table, and find your DynHost identifier in the ID Column. then select the edit icon (pencil) and enter a new DynDNS password. DNS Record Types: OVH supports dynamic DNS record of type A.